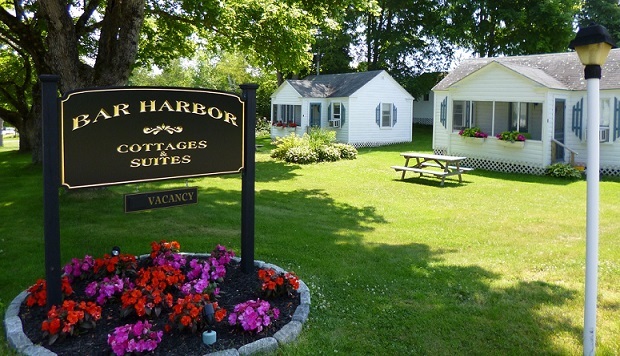 Our desire at Bar Harbor Cottages and Suites is to provide our prospective and many returning guests with an accurate and complete picture of our establishment based on the most commonly asked questions. If you do not find the answers you're looking for, please contact us for further assistance. Q: What makes Bar Harbor Cottages and Suites unique and why should I stay here? A: We are a small family owned and operated business with on site residential manager. Our emphasis is on guest comfort and customer service with friendly well trained staff. We are committed to our effort to continually improve and upgrade our property and service to our guests. If you are looking for a big chain hotel or resort atmosphere, this is not it. However, if you are looking for a comfortable, clean, cozy place to call "home" while you are away, this is it! Q: What is a cottage and what size is it? A: The word cottage conjures up different images to different people from different parts of the country and the world. In Bar Harbor, generally speaking, cottages are smaller versions of a home. They are not as large as your house, apartment, or condo, etc. We have three different styles: studio, 1 bedroom and 2 bedroom cottages, which range in size from our smallest studio Cottage #5 at 240 sqft up to our largest 2-bedroom Cottages #10 and #11 at 520 sqft. Click this link to view our property map. Q: What are your amenities? A: We are a seasonal (mid May to late October) lodging business. We have 12 individual and unattached, self-catering cottages with window boxes on two landscaped park-like acres with garden or water views. 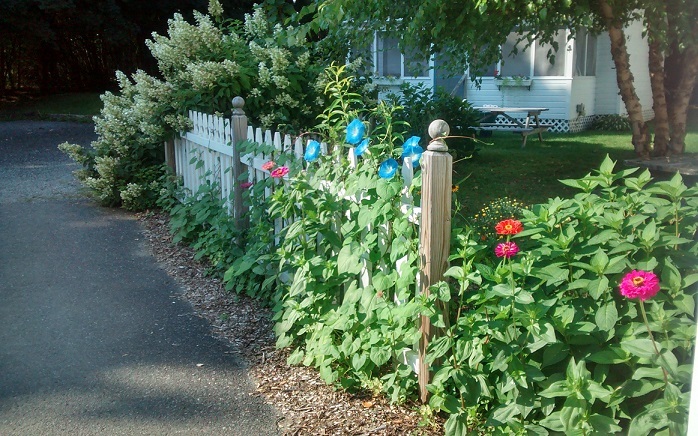 Each cottage has a kitchenette, its own outdoor picnic table and most have screened porches. The studio cottage will accommodate up to 2, the one bedroom will accommodate up to 4, and the two bedroom will accommodate up to 6 people. All have one bathroom with shower. Q: What is a self-catering cottage? A: Upon your arrival, our highly trained staff has set up your cottage with linens, towels, etc. 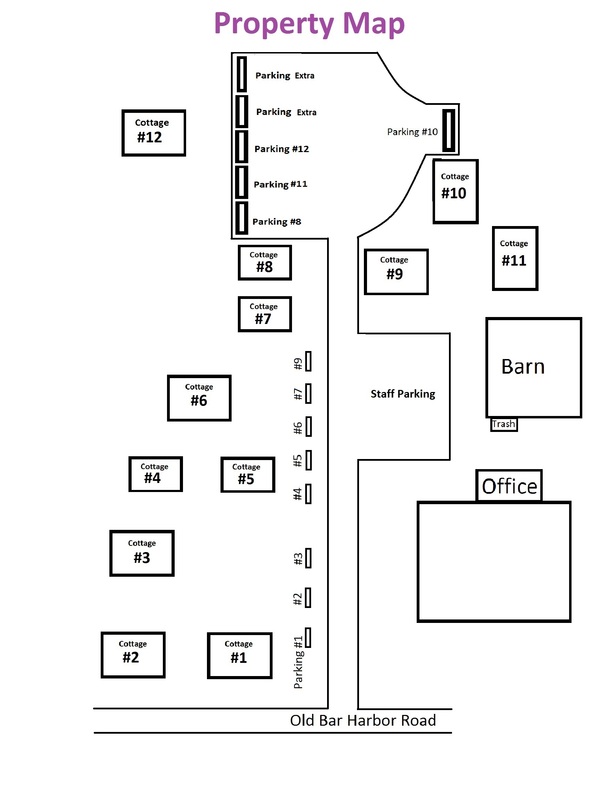 Additional towels and supplies are available daily in the barn. For your convenience, complimentary housekeeping is available mid stay for 7 days or longer. For further details, please contact us. We do not have guest laundry facilities. The nearest laundromat is located a few miles away in downtown Bar Harbor. Q: What is included? A: Air conditioning, heat, designated parking, cable television, free WiFi, linens, towels, pillows, pots, dinnerware, and utensils are included. We provide bar soap, liquid hand soap, dish soap and cloth kitchen towels/rags, but we do not provide shampoo/conditioner or paper towels/napkins. We also have hair dryers and an iron/ironing board available. All cottages have table and chairs, a 1/2 sized refrigerator, toaster oven, microwave, coffee pot, and a 2 burner stove top. Most cottages have screened porches except for Cottage #12, our newest two bedroom cottage, which has an outdoor seating area. All have outdoor picnic tables and grills are available (we do not provide the charcoal). We provide a Welcome Hospitality Basket with tea, granola bar, chocolates and your first pot of coffee with four creamers. We provide coffee filters, but if you enjoy daily coffee, you will need to purchase more for the remainder of your visit. Q: How far are you to Bar Harbor and Acadia National Park (ANP)? A: We are located in the peaceful, picturesque Salisbury Cove section of Bar Harbor, which is approximately 3 miles to the main entrance to Acadia National Park and 4.5 miles to our downtown business district. We are located in Bar Harbor, but not in the business district. We are not on the main road. Q: Are you located directly on the water? 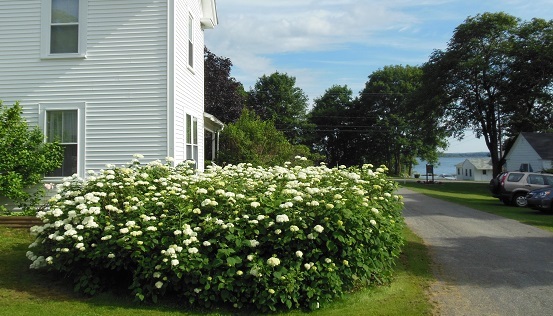 A: Although we aren't located directly on the water, our property is across the lane and our cottages have either partial water or garden views. We do not have shore access. Q: Do you have WiFi? A: We have free WiFi. You can surf the web from anywhere on the property-- in or out of the cottages. Q: Do you have cell phone reception? A: Most people can get cell phone reception on our property. However, cell phone reception is dependent on the individual carrier and we advise guests to check with their service provider for coverage in the area. For your convenience, we have a guest reception office area with a hard wired courtesy phone, which is open 24 hours a day. Q: What is the difference between the guest cottages and the "Victorian Cottage Suite"? A: Each unit, including "Victorian Cottage Suite" (#9), is a free standing, unattached cottage. "Victorian Cottage Suite" (#9), has a partial water view, a queen bed, a new bathroom with shower, living room with couch that sleeps 2, antique wicker furniture, a free standing gas fireplace, a kitchenette and a dining alcove with French door leading to a screened porch. 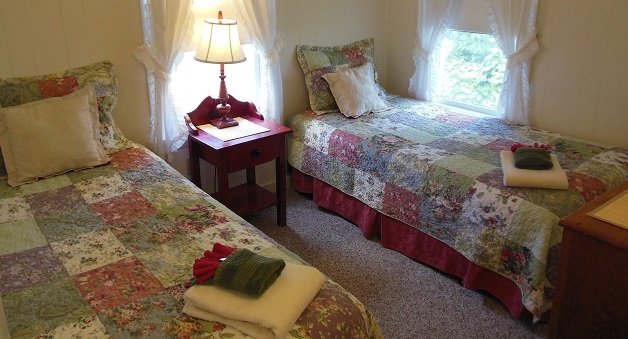 Although "Victorian Cottage Suite" (#9) will accommodate up to 4 people, we recommend it for up to 2 people. It is Our Guest Suite. Q: How far in advance should I make reservations? A: Bar Harbor and Acadia National Park are a point of destination. Frequently people arrive for a day or two and find there's so much to see and do that they have not allotted enough time. We do have many guests who return year after year, so we suggest making reservations as early as possible to help insure you get the dates and cottage you desire. It is sometimes possible to arrive and be accommodated without a reservation, but you have more options booking early. Q: How can I make a reservation? A: You may book online by clicking the green "Check Availability" button on the top right of the home page or by calling our toll-free number daily and guarantee your deposit by VISA, MasterCard, Discover or American Express. For late night calls, please leave a message and we'll return the call as soon as possible the next day. Q: Is tax included? A: In addition to the rate for your accommodation, there is a 9% Maine state lodging tax. Q: What is your cancellation policy and deposit policy? 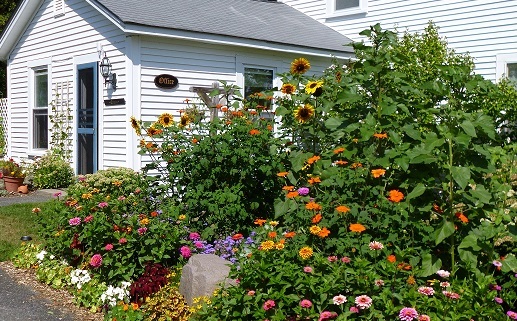 A: There is a 50% deposit and 14 day cancellation policy per cottage. For full details please refer to our rates and reservations page. Q: Are pets permitted? Is smoking permitted? A: Due to the fact that many people have allergies, we are a smoke and pet free establishment. Smoking is restricted to your individual picnic table outside your cottage. Q: What are your office hours and check in and check out times? A: Our office hours are from 8:00 am to 5:30 pm, Monday through Friday with reduced office hours on Saturdays and Sundays from 8:00 am to 4:00 pm. Check-in is between 3:30 pm and 5:30 pm, Monday through Friday. If you are arriving on Saturday or Sunday or are running late Monday through Friday, please call and we will arrange for your late arrival. Check out is 10:30 am. AFTER-HOURS ARRIVALS: Please go to the guest reception area (open 24/7) located in the back of the main house on your right. On the counter you will see a rack marked "After Hours Packets." Your packet will have your name and cottage # on it. Inside the packet is area info, parking assignment, local map, Wi-Fi info and key. We will leave the light on in your cottage. Please come to the office the following morning to complete your check-in. Office hours start at 8 a.m.
Q: Do you offer discounts? A: Yes. We have both daily and weekly rates and a discount is offered if you rent by the week. We also offer value season rates in the Spring and Fall, as well as other special offers. Please check our Specials page. Q: Do you have someone on duty in the office 24 hours daily? A: Since we are a small business, we don't have a late night person on the desk. We do, however, have a residential on-site manager who lives in the office building and may be contacted in the rare case of a late night/early morning emergency. For your convenience, the guest office reception area has a courtesy guest phone and is open 24 hours daily. Q: Do you need to take a ferry to get to Bar Harbor? A: No. Bar Harbor and Acadia National Park are located on Mount Desert Island, which is connected to the mainland by driving over a short bridge. Q: Do I need a car? A: A car is recommended, however, we are a short 3-5 minute walk from the free Island Explorer shuttle, which runs from approximately June 23rd until after Columbus Day weekend. Also rental car agencies are located at the local airport off Mount Desert Island. Q: Where are the airports? A: We have a local airport that services Bar Harbor just off Mount Desert Island (about 15 minutes away). We also have a regional airport in Bangor (1 hour) and one in Portland (3 hours). Q: What is the weather like? A: Weather is much like all New England coastline communities. For your convenience, we recommend that you don't over pack, but bring layers of clothing for warm days and cooler evenings. Q: Is there a supermarket/grocery and place to buy beer, wine and liquor on the island? A: Yes. There are many stores throughout the island. Beer, wine and liquor can either be purchased in the supermarket/grocery or in the liquor stores. We are conveniently located near several. Q: How late do retail stores and restaurants stay open in Bar Harbor? A: Although each proprietor has their own schedule, in general, in peak season, restaurants stay open daily until 9:30 or 10 p.m. Retails stores stay open until at least 10 p.m. As a general rule, downtown bars stay open past midnight.